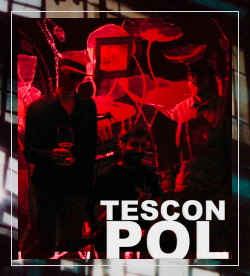 Tescon Pol is the music and miscellaneous art project of Ariel Johannessen and Mic Finger. They craft texturally dense soundscapes comprised of interwoven digital & analog tones, fragmented rhythms, and voice. Spatially evocative, these futuristic cocktails draw inspiration from a diverse legacy of musical influences as well as visual and literary touchstones such as Modernist & contemporary architecture, Absurdism & Existentialist fiction, Cyberpunk fantasy (e.g. the works of Syd Mead, Jean Giraud, Masamune Shirow, Yoji Shinkawa, HR Giger), Art Nouveau, Futurist philosophy, and Constructivist typography.